trinity « Big Squid RC – RC Car and Truck News, Reviews, Videos, and More! You are browsing the "trinity" tag archive. From the Team Trinity people, we recently got news about their new DT Modified Motors. 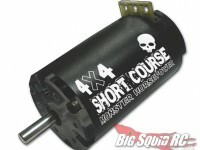 They come in 6-10 turn, are brushless, 540 sized, sensorless, water resistant, and are a direct drop in for Traxxas Vehicles using the stock ESC. Cost is about $99. Check out the Team Trinity web site for more info.